Residents in Kelly have begun circulating a petition for the repair of the White Oak Dike in Kelly. The dike was heavily damaged by Hurricane Florence when two large breaches and four smaller breaches occurred that led to the flooding of the town of Kelly. Aaron Robinson, who is a member of the Kelly Dike Committee, said the petition is available to sign at the Kelly General Store located at the intersection of NC 53 and Natmore Road. The petition can be utilized by the Kelly Dike Committee and the Lyon Swamp Drainage and Levee District Board to demonstrate the residents want the dike repaired. Robinson said the members of the Kelly Dike Committee are still learning about potential resources available to repair the dike and how they can apply for assistance with the repairs. “We’re still seeking guidance from the Corps and waiting on some funds,” said Robinson. The members of the Lyon Swamp Drainage and Levee District, the Kelly Dike Committee and the Bladen County Commissioners along with other local leaders all met with US Congressman David Rouzer in March. The White Oak Dike and its need for repairs was one of the topics discussed. Rouzer advised the group they should consider looking to state agencies for assistance rather than federal agencies. “I haven’t heard anything from him since that day,” said Robinson of the meeting. Chairman Peterson stated the county is working with the State of North Carolina, Congressman Rouzer’s office and others to find resources to assist with repairing the dike. Peterson noted that there once was a special tax in place that was assessed to Kelly residents to help with the upkeep and maintenance of the dike but at some point it was discontinued. He said the important thing right now is to find the funding to make the necessary repairs to the dike and get the White Oak Dike added back to the Corp’s Rehabilitation and Inspection Program. The dike was removed from the inspection program in 2001 due to “significant deficiencies” that were noted by the Corps of Engineers. 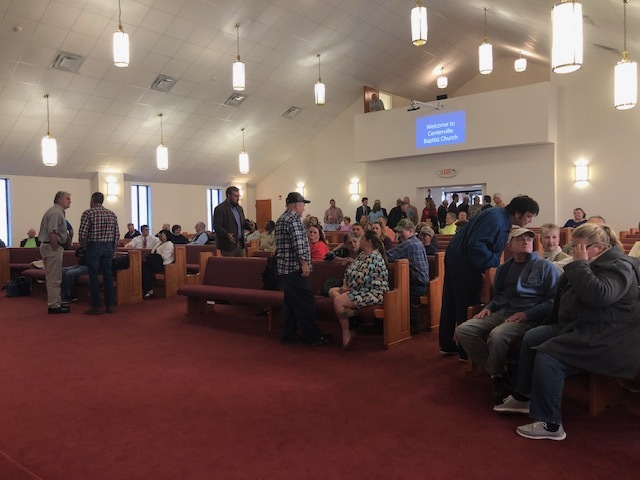 In the public hearing conducted in March at Centerville Baptist Church, Michael Hall, an engineer with the Corps of Engineers, explained to the audience the White Oak Dike was removed from their inspection program in 2001 due to “significant deficiencies.” Hall said the Lyon Swamp Drainage and Levee District, who was responsible for the actual maintenance of the dike, was notified the White Oak Dike was being removed from the Rehabilitation and Inspection Program. Bladen County Soil and Water Conservation District Director Dean Morris said the first five miles of the White Oak Dike were constructed before the US Army Corps of Engineers made improvements to the dike following the flood of 1945. Morris said the White Oak Dike actually belongs to the Lyon Swamp Drainage and Levee Committee. He explained that the Corps of Engineers turned the project over to the Lyon Swamp Drainage and Levee Committee to manage. “That is what the Corps does. They build projects and then give them to the community,” said Morris. He stated that the county has been in contact with the Emergency Watershed Program to learn if there may be funds available through that program to help with repairs. Morris explained that because the Corps of Engineers was involved with the dike, the Emergency Watershed Program could potentially be a good source of funding. County officials are working to learn about the application process for the program. He said county staff have documented the breaches and they are also working to gather documentation regarding easements and other documents related to the construction of the dike. The White Oak Dike currently measures 14 1/2 miles with a five mile section that reaches into Pender County. It was constructed to withstand a flood event of the magnitude of the flood that struck in 1945. Hurricane Florence actually exceeded the flood of 1945. “This (Hurricane Florence) was an unprecedented event,” said Morris. According to the Corps of Engineers, Hurricane Florence led to new record flooding in the Kelly area with flood waters reaching 30.68 feet. The 1945 flood which prompted strengthening the dike measured 29.80 feet and flooding created by Hurricane Matthew measured 28.58 feet.